The following blog post is by 17-year-old Fatou from Senegal. Fatou is a member of World Vision’s Young Leader Network, a project designed to give children and young people space and opportunity to gain skills, knowledge, and tools to engage in campaigns across the globe aimed at ending violence against children. 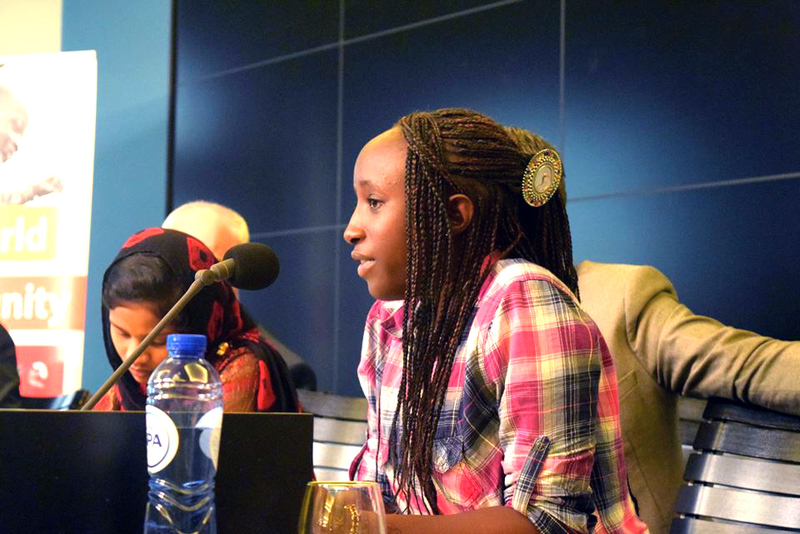 Fatou is a committed child advocate for gender equality and ending child marriage and violence against children. She wants to become a judge to protect children. I am writing this blog to represent the voices of all the girls from Senegal and the world, so we girls can have our voices listened to in the fight to end violence against children. Girls are becoming more exposed to all forms of abuse that can affect their futures. That is why I am talking about violence against children in my country, Senegal. The number of children who are victims of violence is very high. Child marriage continues to be a widespread phenomenon in my country with nearly 1 out of 3 girls married as a child. I would like to focus your attention to this issue as this is one of the most common causes of violence against girls in my community. Each year, a lot of girls are forced into marriage sometimes even before they reach the age of 15. Overall, many girls across Senegal are married as children. How can it be a good thing to be a young girl who is already married and pregnant? Girls who are married are exposed to violence, abuse, and risky pregnancy. In Senegal, the mortality of young mothers under 20 and their babies is very high. Married girls often drop out of school as soon as they become pregnant. I have seen that many times and want to share with you two stories from my own community. A father forced a girl who was only 13 years old into marriage. Just three months later, the girl was pregnant and then a miscarriage and died. A friend of mine who was 16 years old was given in marriage by her grandfather. He thought he was protecting her from pregnancy out of wedlock. She refused to get married, and as a result, her whole family abandoned her. As she was very sad due to her family’s reaction, she finally agreed to get married to be reunited with her family. Now she faces horrible forms of abuse from her husband. In order to put an end to these abuses, we need to work more with the communities and to educate girls, parents, adults, and local authorities about violence and abuse against girls. I am doing it myself as a peer-to-peer educator, which means that I am conducting sessions to empower my classmates and peers on ending child marriage and violence against children. I would like to ask each of you to examine your conscience and stand by us and help us in ensuring the protection and well-being of all girls. We girls have the courage and strength to overcome problems but we are also vulnerable, and we need to be supported to have a bright future. So, I ask you to help us, to stand by us, and protect us from any obstacles to our survival. How will you get involved? Please ask your member of Congress to cosponsor the bipartisan resolution on ending violence against children. Your voice can make a big difference. ← Will you join us in prayer on October 1-2? I am a strong advocate for speaking out against abuse against children. I have personally seen the effects of abuse on children in our community and it is heart breaking. I want to be a voice and help our children find their voice to speak up and speak out. Violence is not the answer. I am all supportive of ending volence against children! But, isn’t it a bit of a joke to think Congress would act in support of such a bill. Congress just selected a questionable Supreme Court Justice, who doesn’t have a good track record on sexual violence himself while under the influence of alcohol.